Xbox 360 backwards compatibility – looking back to the future? With E3 around the corner, we’re coming up on the one-year anniversary of Microsoft’s backwards compatibility program for the Xbox One. 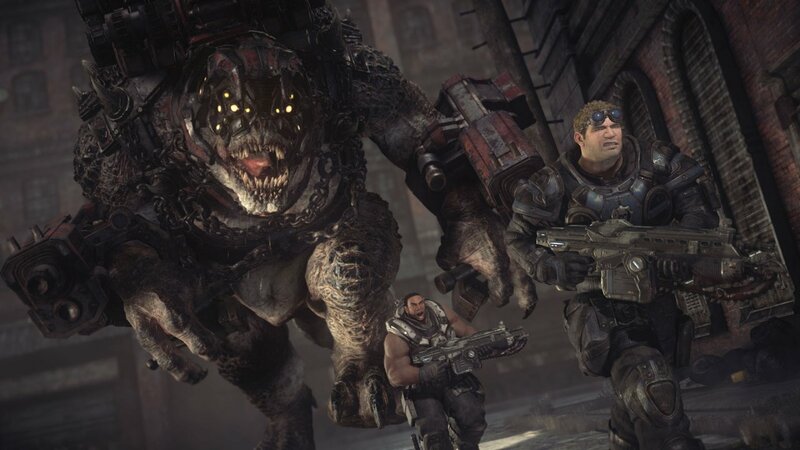 Announced by Phil Spencer on-stage at Microsoft’s E3 presser last year, the program allows players to revisit a growing number of Xbox 360 games that might otherwise have been left behind, and now seems to be a good time to take a look at the current state of backward compatibility on Xbox One. 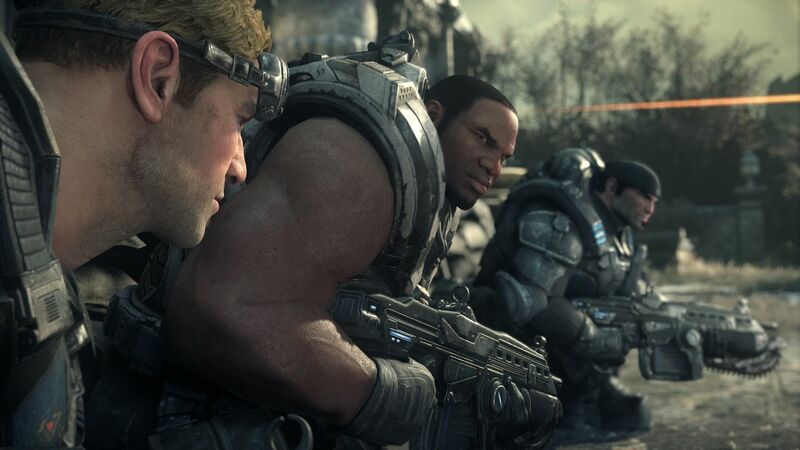 There are currently over 150 games available, and while the most sought-after titles (as voted for at the Uservoice page) such as Black Ops II, Skyrim or Red Dead Redemption have yet to surface, there are still some heavy hitters ready to play right now – games like the original Black Ops, which has just been added, the entire Gears of War saga, Halo Reach and Halo Wars, and Alan Wake. Some publishers seem to be happier than others to make their games available on the service, with Sega in particular showing strong support; just recently we’ve had Jet Set Radio HD, Sonic & Knuckles and Phantasy Star II added, among others. Here’s hoping for Sonic Generations and Racing Transformed before too long. Backward compatibility was Microsoft’s big surprise announcement last year, and one wonders how they might follow that up next month. Spencer has previously indicated that he’d love to see original Xbox compatibility make its way to the Xbox One, and while I’d personally love to see that happen (if only for the Sega exclusives still stuck on that platform), I think we’ll likely be waiting a while for that; while additions to the 360 catalogue have picked up a bit recently, it’s still going to be a while before the bulk of that catalogue is available on Microsoft’s newest machine, so that’s undoubtedly where the team’s focus will be for the foreseeable future. Having said that, Mike Ybarra, one of the main minds behind 360 BC, has indicated that his team have a couple of things in the pipeline that are on the same scale as that E3 2015 announcement, so who knows? It’ll be interesting to see what they bring to the Los Angeles Convention Centre next month. There’s an ongoing joke about backwards compatibility that says it’s the feature everyone wants but nobody uses, and that past the first year of a new generation, as the hardware beds in and more games begin to take advantage of the additional power, it gets forgotten. For my part, I’ve always made rather sparing use of backwards compatibility in generations past, but to my mind, two things make the Xbox One feature particularly great. First of all, I’m still playing 360 games. The previous generation was a long one and I’m sure I’m not the only one who still has some kind of backlog on their last gen systems – I’m yet to play South Park: The Stick of Truth, which is one of the games playable on the Xbox One. Knowing I can get around to it whenever I feel like it without having to hook up another system is pretty handy, and I hope some more of the games in my backlog, like Binary Domain and Asura’s Wrath, get added down the line. 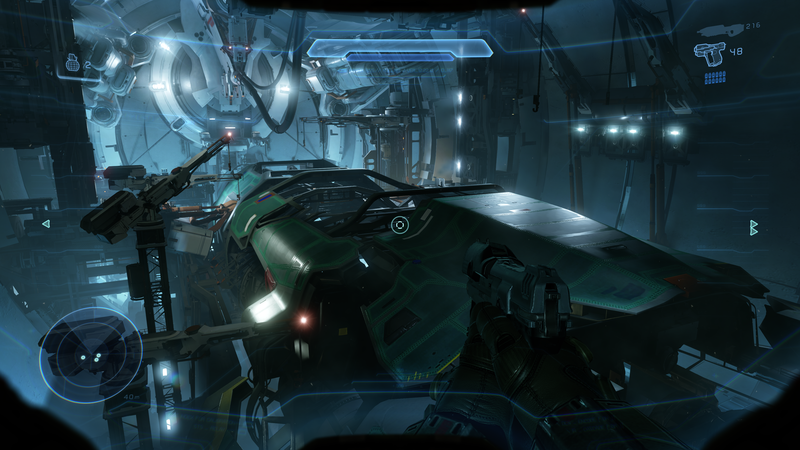 Don’t get me wrong, I still have my 360 hanging around, but it’s not always hooked up, unlike my Xbox One, which is always connected in order to feed my Halo 5 addiction. Secondly, there’s the way the feature integrates with your existing library. You can of course simply put a compatible disc in, download the game and then play, but it’s the ease with which your digital purchases carry over that makes backward compatibility such a pleasure to use. Maybe you bought The Witcher 2 on the Xbox store a few years back, or got Gears of War 3 via Games with Gold? 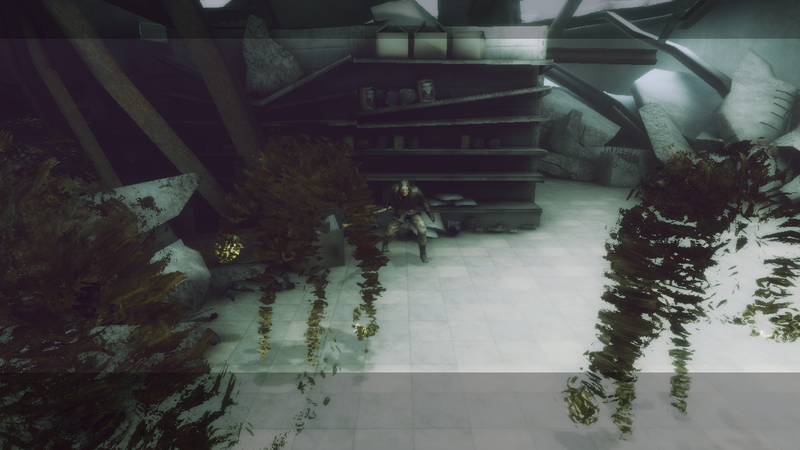 Perhaps you bought Shadow Complex back during 2009’s Summer of Arcade? All of them will simply appear in your download list on the Xbox One, ready to go when you want them. I already have around 50 Xbox 360 games installed on my Xbox One, and it almost makes the console feel a little bit like my PC Steam account; I can just pick from a bunch of games and then launch one without having to get up and switch discs. Add to that the ability to use Xbox One-specific features like taking screenshots or game clips, or even livestreaming, and they may as well be native games. 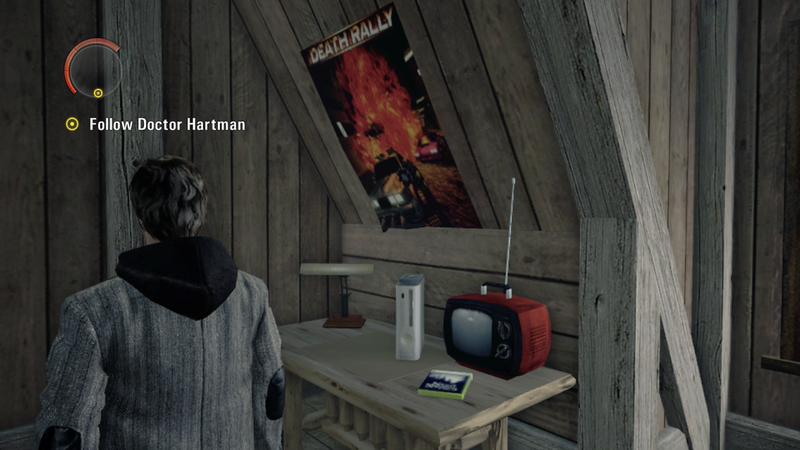 Just ’cause Alan’s still got his 360 hooked up doesn’t mean we all do. While the backward compatibility program hasn’t noticeably moved the needle on console sales (and I imagine that the main aim of it was to encourage 360 owners to make the jump), it’s certainly a crowd-pleaser for those already deep within the Xbox ecosystem, and it makes me wonder what Microsoft’s plans are going forward. We’ve had comments from Spencer about mid-gen hardware refreshes in the last few months, and with the recent PlayStation 4 Neo leaks – including the expectation that it’ll be both backwards and forwards compatible – it’s looking like the console landscape will be moving to a model of iterative hardware, with the focus on an evolving platform, rather than a specific piece of hardware. Imagine buying a console in 2026 that also gives you access to everything you bought back in 2006. Or even 2001. What if there’s no PS5 or XB2, but instead just a ‘PlayStation’ and an ‘Xbox’ that play all of your games, past present and future. Wouldn’t that be pretty amazing? To me, Xbox 360 backward compatibility feels like Microsoft’s first step in enabling a future like that. It’ll be interesting to see where they go from here. NieR: a cult classic you shouldn’t miss. Though it has since become the embodiment of the term ‘cult classic’ for the PS3/360 generation, NieR had something of an inauspicious start. Released a mere month after the hotly-anticipated Final Fantasy XIII to a middling critical reception, the game was hamstrung before it even hit store shelves. 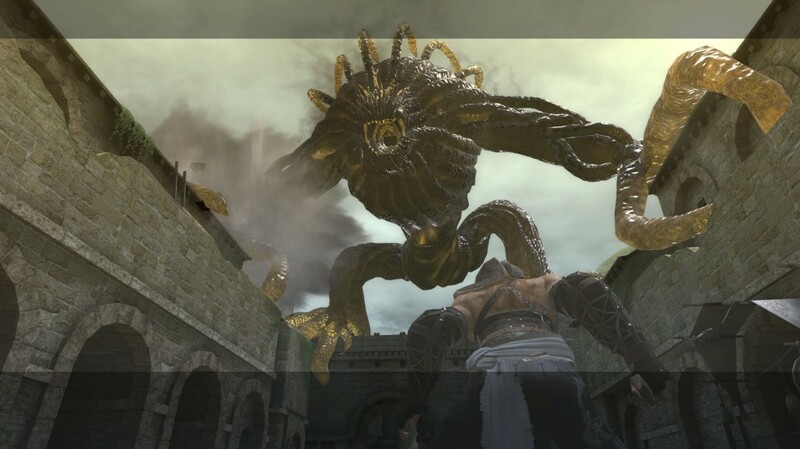 The fact that NieR was a spin-off of the already-niche Drakengard series that followed on from the first game’s ending E – where a giant statue and a red dragon faced off over the Tokyo skyline before being shot down by fighter jets – certainly didn’t help. Things aren’t made much clearer when we get into the game itself, which opens in the summer of a post-apocalyptic 2049 as a desperate father strives to defend his sick daughter from strange, ethereal monsters. Realising he can’t beat the massed horde before him, he reaches for a strange book that seems to grant him magical powers. And then we spend about half an hour in a car park beating the crap out of monsters with a length of pipe. It’s not a great start, admittedly. BEHOLD MY MIGHTY LENGTH OF PIPE! Things get even weirder as we abruptly jump 1312 years into the future. Far removed from whatever ravaged the world in the past, mankind now lives a more feudal existence, inhabiting small villages in and around the ruins of civilization. In one of these villages, a peaceful, green, walled settlement surrounded by vast, empty plains, live an oddly-familiar man and his sick daughter. In fact, they look exactly like that same pair from thirteen-hundred years ago. There’s absolutely no acknowledgement of this, of course. 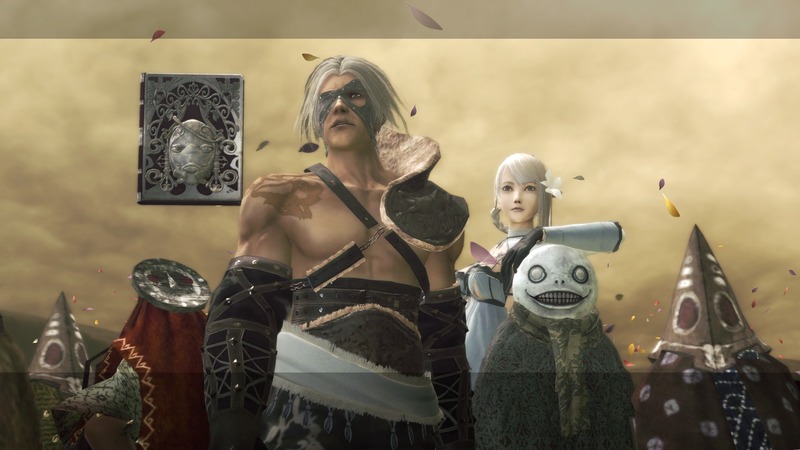 With a short voiceover, Nier tells us that his world is slowly winding down, once thriving populations now ravaged by disease, while strange monsters known as Shades roam the land, killing all those in their path. But Nier doesn’t care about any of that; his personal struggle is to save his daughter Yonah, and to hell with everything else. At the same time the player is on a parallel, and at times opposite, quest to discover just what happened in this strange world. Why do two people from 2049 appear to be alive in 3361? What was it that destroyed human civilization in the past? And just what are these Shades? Maybe Nier doesn’t care what’s going on, but you certainly will. 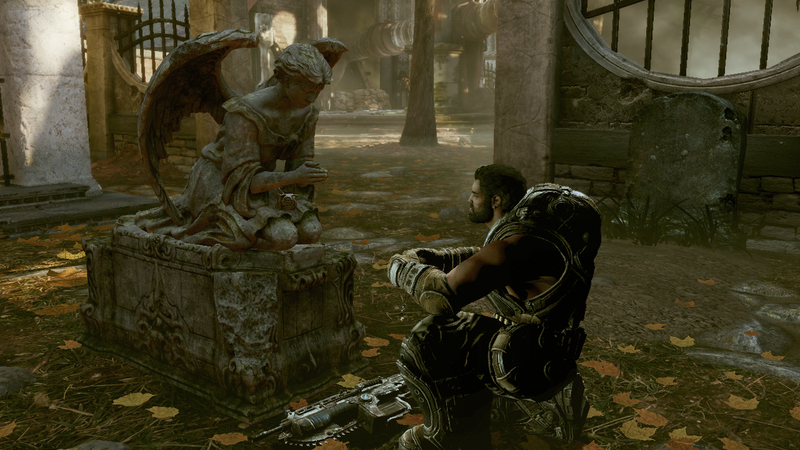 While many fans feel the game was given short shrift, it’s kind of understandable that critics were a bit mixed. 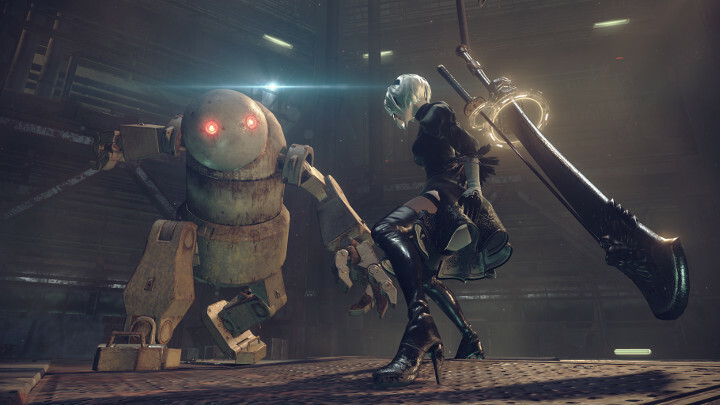 NieR is a difficult game to review; on the face of it, it doesn’t really excel at much. It’s a game of competent design in graphical and gameplay terms, feeling something like a knock-off 3D Zelda to begin with, as you start in a small village hub, before journeying out onto a vast green plain and beyond. 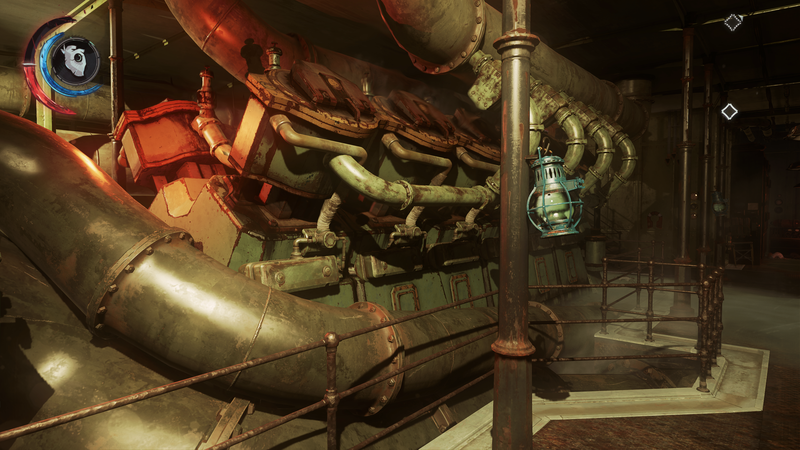 It’s fair to say that the graphics aren’t going to wow you, with much of the world being made up of blandly textured, low-poly environments, but despite the low-budget looks there is some really memorable design work to be found. 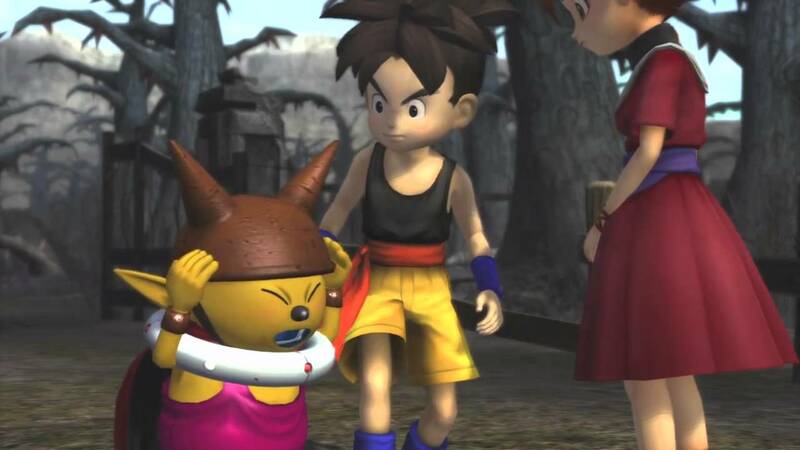 These are not your average jRPG companions. Nier isn’t alone in his quest to save Yonah, of course; he’s joined by an interesting cast of characters in Grimoire Weiss, a talking book that grants him magical abilities (wonderfully brought to life by Liam O’Brien channelling the dearly-departed Alan Rickman), Kaine, a foulmouthed female warrior that likes to kill things first and ask questions never, and Emil, a young boy whose eyes can petrify anyone they look at. Your party members all see a lot of growth over the course of the story, especially Kaine, who, despite her rough edges, almost ends up being the heart of the game. Each of them also has a fantastic, memorable look to them, and while it’s unfortunate that the player character is rather bland looking, the same issue actually works in the enemies’ favour; the game’s oddly-intangible Shade enemies are barely recognisable as anything other than wispy, vaguely-humanoid shapes, and considering we aren’t supposed to know what they are or where they come from, it’s a smart way for both narrative and design to work together to help mitigate such visual shortcomings. Likewise, there are some fantastic locations to be found. If the starting village is a touch underwhelming, and the Northern Plains nothing more than an expanse to be raced across from one plot point to another, you absolutely will not forget the Aerie, a suitably-eerie village suspended over a seemingly bottomless canyon that has shut itself off from the world, or the desert city of Façade, whose masked inhabitants must adhere to tens of thousands of arcane rules that govern every aspect of their lives and decree that no two buildings can be built on the same level. And the first time you see the Lost Shrine, an ancient sanctuary built atop a spire of rock that rises out of the mist in the centre of a cavernous valley, you’ll be left a little breathless despite yourself. 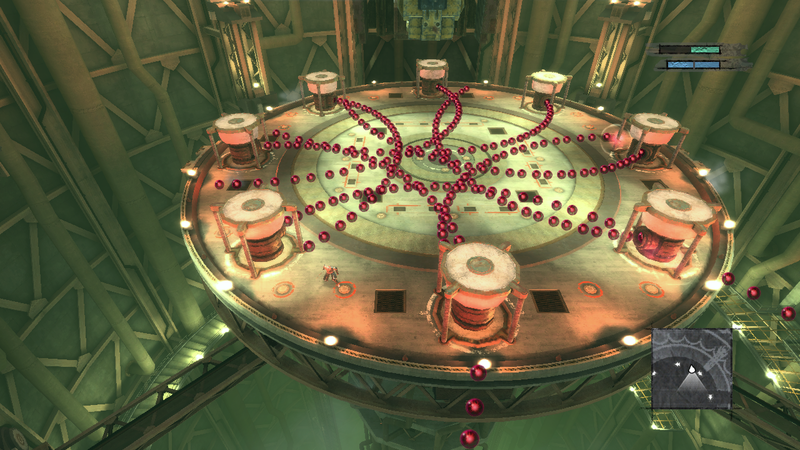 NieR‘s world may not be rendered in the highest detail, but it has a tremendous sense of place. Similarly, combat isn’t going to win any awards, being fairly workmanlike for the most part. There is a decent degree of depth there for those who care to look, with three different weapon classes to get to grips with and upgrade, a handful of magic spells, as well as words, equippable modifiers that will boost stats or add status effects to your arsenal. But in all likelihood you’ll stick to a single weapon and two or three of Grimoire Weiss’ spells for much of the game – there’s just not much of a reason to mix things up. Boss fights are another story entirely though. Huge, multi-part encounters that are half-RPG boss, and half-bullet hell shooter, these are fantastically imaginative moments that will live long in the memory – especially the two set in the Aerie that see the fighting span the entire town, forcing you to run, jump and climb all over its bridges and walkways to vanquish these enormous beasts. Yes. You will have to fight this guy. 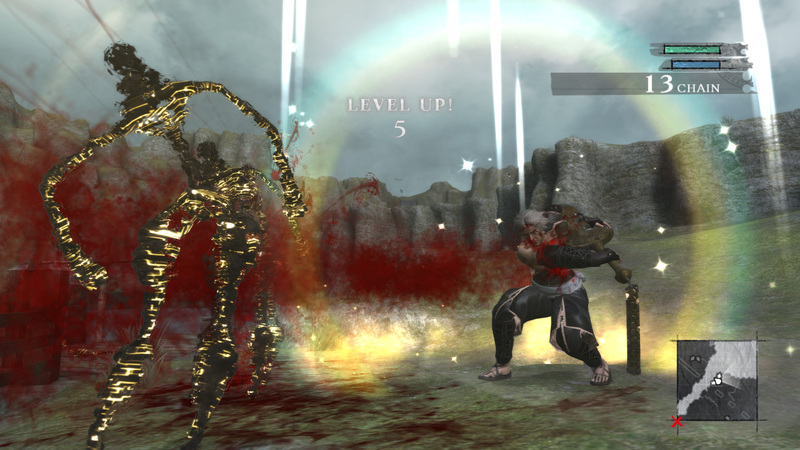 Happily, average graphics and competent combat isn’t all that NieR has to offer. If there’s one game in recent memory that truly is more than the sum of its parts, this is it. The game excels in characters, story and music, all of which lend the whole a deeply mysterious, otherworldly atmosphere. On the narrative side, though much of the game is framed as a simple tale of a father striving to save his daughter, there’s far more going on than that – as should already be evident from that initially-baffling time-jump at the start of the adventure. Though you’ll get some resolution by journey’s end, there’s still much left unexplained, and it’s a decidedly muted ending; sure, you achieve your goal of saving Yonah, but at what cost to the rest of the world? Nier frequently reminds us that he cares only for his daughter and his friends, and his actions reinforce this. But more often than not, he’s acting out of complete ignorance of the bigger picture. It’s almost like the apparent simplicity of the narrative seeks to mislead the player, and this same disregard for convention can be seen in gameplay, too. While structurally NieR is an action RPG, it doesn’t take long for the game to start messing with your expectations; enter a creepy mansion and you’ll find yourself in a Resident Evil game, complete with fixed camera angles and arcane key systems. Dive into an underground research lab and suddenly you’re in an isometric dungeon crawler. Need to ascend a series of scaffolds to reach a higher vantage point? Now you’re in a 2D platformer. Best of all is the section in the Forest of Myth where the game transforms itself into a text adventure for a short while, capped off with a few simple logic puzzles. Director Taro Yoko has said that this genre-hopping is something of a response to modern games that give up all their systems in the first thirty minutes, leaving little new to look forward to, and while it does give NieR something of a ‘master of none’ feel, it is genuinely refreshing to mix things up every now and then. It’s like Cave made a 3D action RPG, and it is glorious! Topped off with a stunningly melancholic soundtrack from Keiichi Okabe that mixes haunting choral pieces with gentle piano-led compositions and rousing, vocal-led battle themes, it all comes together to create a package that is far greater than the sum of its parts. NieR is mechanically solid, graphically average, and yet utterly, utterly unforgettable. It’s of course something many have touched on in recent years, that we seemingly have little input in many of the games we play, save for killing, and that these murderous sprees are rarely, if ever, acknowledged by the characters we embody or those around them. 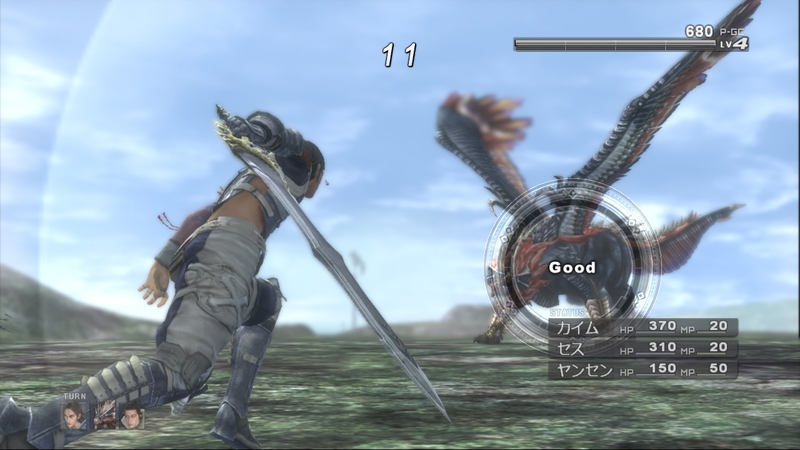 It’s not really something Yoko’s games strive to change, as such – Drakengard and NieR are action RPGs where you kill lots of enemies, of course – but he often uses the characters and narratives of his works to make players at least question this act and what it means for these worlds and the people that inhabit them. In the same interview, Yoko explains how his views shifted post-9/11, as the rise of terrorism and ideological conflict changed the vibe he got from the world at large. Now the world seemed to be saying that you don’t necessarily have to be insane to kill someone, you just have to think you’re right. This thinking heavily influenced NieR, where the player character willingly slaughters his monster-like enemies without even knowing what they are and why they might be hostile. Indeed, he doesn’t even care, at one point responding to the insinuation that these are intelligent, sentient beings with the retort, “I don’t care if they can tap dance and play the fiddle.” What begins as one of Nier’s defining, positive characteristics – his desire and willingness to do anything to save his daughter – is turned on its head later on as players are made to wonder if it isn’t Nier, and by extension the player, that’s the real monster, the true danger to the world. Those famous – or perhaps infamous – multiple endings play into this turnaround quite wonderfully, giving us new perspectives on events we’ve only seen through the rather blinkered, misled eyes of our protagonist, whether that be understanding the strikingly-familiar motivations of the apparent villain of the piece, or being able to understand the speech of the Shades you’ve spent twenty hours slaughtering. The game doesn’t allow you to deviate from the path, even with this knowledge, and it’s actually stronger and more affecting for that; at one point, you’re made to realise that a seemingly powerful boss you might have struggled to vanquish earlier was actually a defenceless child that you’re made to kill. Armed with that knowledge, it’s genuinely unnerving to be forced to do so. And should you make it to the fourth ending, you’re rewarded with a bit of quite brilliant fourth-wall breaking that is almost painful to watch. It’s absolutely worth seeing. Looking back at his body of work, it’s clear that Yoko has ambitions that frequently outstrip his means, so it’s incredibly surprising to see a Platinum Games-developed sequel on the way. That’s certainly a team that understands gameplay, and with Yoko and Producer Yosuke Saito returning at the top, character designs by Akihiko Yoshida (of Ivalice fame) and another astounding soundtrack from Keiichi Okabe, Nier Automata is shaping up to be one of the most exciting games coming out this year.